The four surviving bulldogs that were rescued from Billie's Bullies, were successfully rehomed and dearly loved. Spike continues to live with us and is a very loved and very special member of our family. In August of 2005, he was diagnosed with dilated cardiomyopathy, a heart condition which will in all likelihood be the thing that takes him from us some sad day in the future. But for now, Spike is on medications that have improved his quality of life and given him more energy. At nine years of age, he is a happy and much loved boy and adds so much joy to our lives. Tragically, Apache, who was renamed Hank, "snapped" mentally in June of 2004 and the sad decision had to be made to help him cross the Rainbow Bridge. It seems such a shame and a waste, since he had become physically healthy and was looking wonderful. He had always been somewhat dog aggressive, but suddenly he became very aggressive toward people and had become dangerous. Our consolation is that Hank, like the others, knew love and safety and nurture for at least a short while at the very end of his life before he crossed the Rainbow Bridge. The reunion photo below of the four rescued dogs was taken less than a month before Hank died. Otis was nearly blind due to untreated chronic eye infections that he suffered prior to being rescued. He was placed in a loving home with a family that already had a son of his, Oscar. Sadly, both Oscar and Otis crossed the rainbow bridge in the first half of 2005 within months of one another. Peekaboo was renamed Darla and made her home with a family that adored her. Suddenly and unexpectedly, this beautiful girl passed away in May of 2005 from kidney failure, leaving behind a family who mourned her but was happy for the time she spent with them, however brief it was. Ancient Egyptians believed that, upon death, they would be asked two questions and their answers would determine whether they could continue their journey in the afterlife. The first question was, “Did you bring joy?” The second was, “Did you find joy?” Did these rescued bulldogs find joy? We hope so. Did they bring joy? Oh, yes! More than anyone can say. Meanwhile, Spike has recovered beautifully from the surgeries he had last summer. His quality of life has improved dramatically. Dr. Alan Kuzma of Animal Critical Care Group in Canada performed Spike's surgeries on June 17, 2004. There was a great deal of excess tissue that was resected from Spike's soft palate but his larynx was in good shape and his breathing is tremedously improved. His tail was amputated and the enormous abcess was all removed. 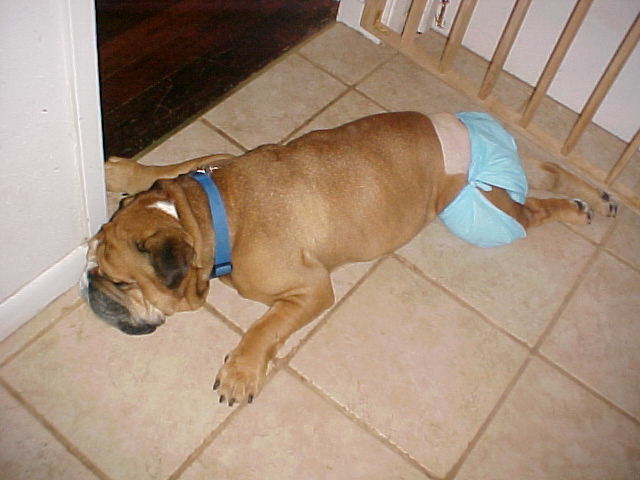 Spike did have to wear a diaper for the first day or so after he came home because of some minor oozing, but that cleared right up. Dr. Kuzma commented that he didn't know how Spike had survived this long in this condition. Spike was supposed to spend two nights in the hospital but was so homesick and agitated that he came home after just one night. He lost five pounds during the course of his surgery and recovery but has regained that now and is up to a healthy 55 pounds. Six days after the surgery, two of the eighteen staples that were used to close the incision came out. Rather than re-staple the wound, the vet chose to use a product called AluSpray, which is a medication in the form of spray paint. It sealed the wound and promoted healing; worked like a charm. The only drawback, if you can call it that, was that the spray was a shiny silver color. We told everyone that Spike had a chrome bumper! 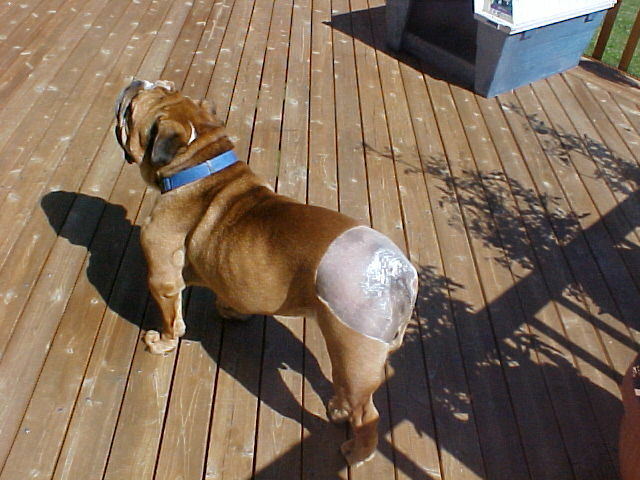 On September 8, 2004, a small wound unexpectedly opened up on Spike's now-healed incision near where his tail once was. He was immediately taken to the vet and was prescribed antibiotics, just in case any infection were present. His prognosis is excellent. He will always deal with arthritis from years of lying on the cement floor of the kennel with no bedding and as he ages, the arthritis progresses. Daily doses of anti-inflammatory medication gives him some degree of relief. Spike's teeth became loose before he was rescued due to malnutrition. They remain extremely crooked, some of them even jutting straight out at a nearly 180 degree angle. Spike has lost many teeth since his rescue and will eventually be on a diet of soft food only. He will have to have daily eye ointment for the rest of his life as well, and there is always the possibility of future infections from the tail amputation site cropping up. In August 2005, Spike was diagnosed with dilated cardiomyopathy and was placed on lasix and enalapril to treat that. Since being on the medication, his breathing and energy levels have improved noticeably. Spike's quality of life is very good and he is an incredibly loving and good natured soul. We are so blessed to have him in our family. 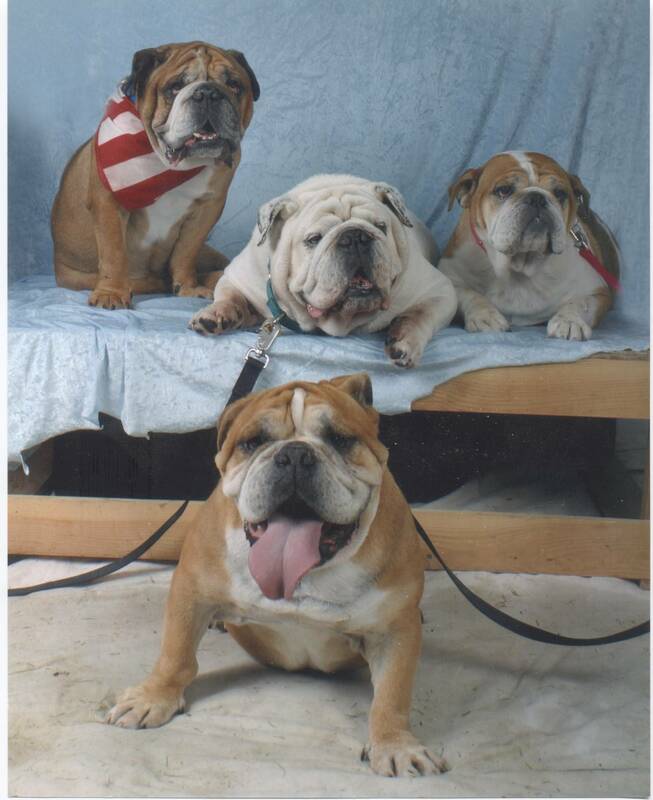 In the past years and months, our family has travelled a long, often difficult, and always rewarding journey, one that started in February of 2004, when four starving bulldogs were rescued in Custer, WA. We were the ones blessed to adopt one of these courageous dogs: King Arthurs Delta Yankey, otherwise known simply as Spike. When he came to us, he was malnourished, infected, and neglected. But he knew his days of hunger and of cowering were over, and we knew we would do anything we could to help him. But we didn't know that he would become so very dear to us, and that he would touch so many lives with the story of his triumph over cruelty and neglect. Those first days and weeks were hard. Spike was emaciated and infected and in dire need of surgery. It took some months to raise the money and to get him strong enough to endure the surgery. During that time, we did all we could to bring his tormentors to justice and to raise public awareness of the horrors these animals had endured. Spike was featured in two newspapers and on two local radio stations, making him a local celebrity. Fame didn't change Spike, though. Through it all, through the treatments and surgery and all the attention, he remained the sweet, loving soul that he was from day one. And he was so grateful for everything, for every bit of food, for every kind word, for every pat on the head and scratch behind the ears. I doubt that I will ever encounter another soul so gentle and so humble. Over course of a month or so, our beloved boy began to decline steadily. This brave, stubborn boy who had endured so much and had come out on top was winding down, and it pained us to see it. The thought of losing him pained us more, though. We hoped that he would rally as he had in the past, but that was not to be. His strong chest diminished and his ribs and spine were visible. We knew he was slipping away and we were powerless to stop it. Spike had trusted us implicitly from the beginning to take care of him. He never denied us his love or devotion. He looked to us with trust and love so profound, and the unbelievably difficult decision we had to make became clear. We had to let Spike know that he didn't have to be brave anymore, that he didn't have to put up a brave front, that he could go to sleep one last time. It was our obligation to give him back the strength and dignity that time and sickness had taken from him. It was our obligation, and the last, greatest test of our love. In the time he was in our lives, we would have done anything for him. He was rare, unique, heroic. He gave his love to us so freely, he never held a grudge, he never wanted a thing for himself. And now we were compelled to do the one thing that we did not want to do, the one thing that we thought we could not bear to do: we had to say goodbye, we had to let our sweet, brave boy go. We had to give peace and rest to his weary body. A huge hole is now in our home and in our hearts, where Spike once was. Our friend, our confidante, our companion, our hero is gone. We are filled with sorrow and loneliness but also with love at the remembrance of him and the time he was with us, and with expectation of the day we will meet again. 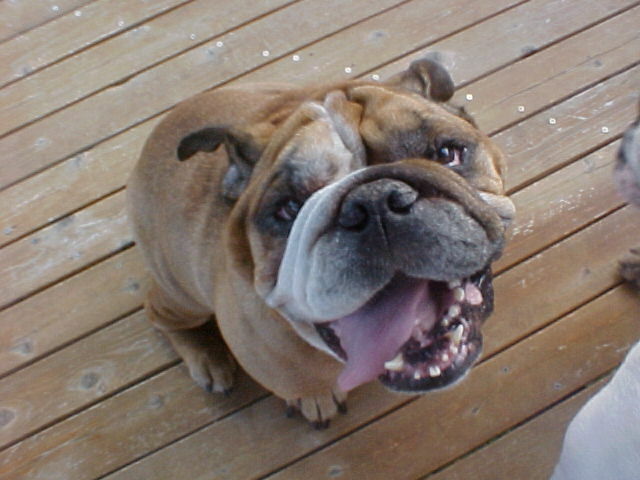 We are forever grateful to have loved and been loved by our sweet gentle old bulldog, Spike. We were overwhelmed with compassion for him. We were devastated by the cruelty and indifference he knew in his past. And we have experienced an exquisite joy from sharing our hearts with this heroic boy. We are better people for it. Goodbye, sweet boy, sleep sweetly. We miss you so. "Our animals shepherd us through certain eras of our lives. When we are ready to turn the corner and make it on our own…they let us go." Show your support for Spike by purchasing postcards, stickers, and more with his image!